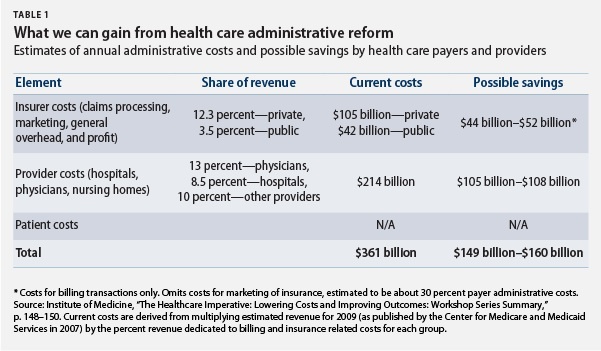 Administrative costs in the U.S. health care system consume an estimated $361 billion annually—14 percent of all health care expenditures in our nation. At least half of this spending is considered wasteful. In a time of large budget deficits, tackling excessive administrative costs offers a promising opportunity for reducing health care costs while improving patient care. The proposals outlined below can lead to systemwide savings of up to $40 billion per year by eliminating wasteful administrative spending. Administrative costs: Who pays how much? How much can we save? Administrative complexity exists at all levels of the health care system, resulting in inefficient spending and delays in care. To reduce this burden we have developed a three-pronged strategy focused on integration, coordination, and leadership. Integration: Electronic capabilities for administrative transactions should be integrated with health information-technology initiatives so all stakeholders can communicate electronically and in real time for improved care delivery and efficiency. Bring health care providers (physicians and hospitals) online. The meaningful use criteria—which created financial incentives to ensure that providers use the data in electronic health records to improve the quality of patient care—should integrate the recording and analysis of clinical services with the billing for those services. To further encourage provider participation in administrative reform, policymakers should offer incentive payments to some provider organizations—those engaged in Affordable Care Act payment reform initiatives that also meet administrative-simplification quality benchmarks. This funding could help catalyze necessary investments in information-technology infrastructure. 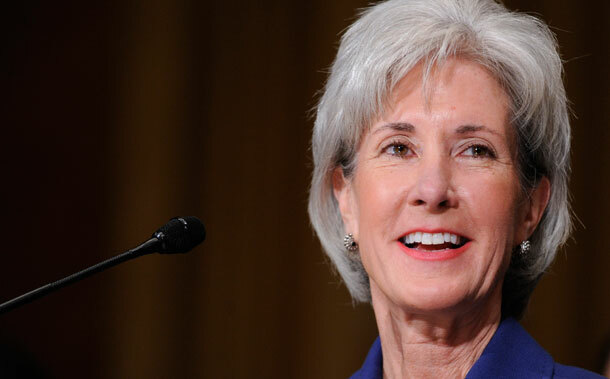 Additionally, the Medicare program should encourage administrative simplification efforts. The Medicare Accountable Care Organization quality measures, for example, should include a measure of efficiency. Coordination: Bring together similar administrative processes by different health care participants to maximize efficiency. Reporting and enrollment systems should be coordinated across national, state, and local regulatory bodies to reduce redundant tasks that take away from patient care. Maximize efficiency by streamlining programs. 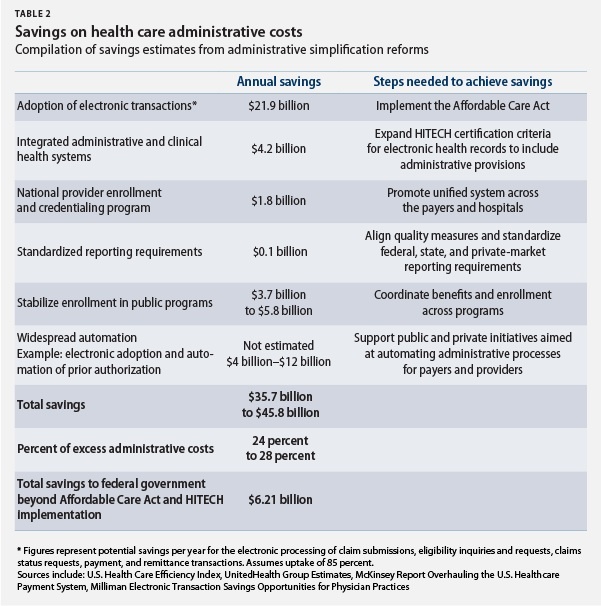 To minimize administrative expenses related to time-consuming and costly provider enrollment and credentialing processes, the Department of Health and Human Services and the private sector should work together to create a centralized, mandatory provider enrollment and credentialing system that will provide all essential data to necessary stakeholders both in the private sector and in public programs. Standardize quality- and safety-reporting initiatives. Government regulations, reporting requirements for quality and safety programs, and state licensure restrictions should be standardized to promote greater uniformity and lower compliance expenses. Public and private organizations should work to harmonize and centralize national, state, and local regulations, reporting requirements for quality and safety programs, and licensure restrictions to align with those proposed under the National Strategy for Quality Improvement in Health Care. In addition to this standardization, public and private entities should leverage health information-technology so that quality reporting is integrated into patient care and automated through the use of electronic health records. Ensure continuity in public program enrollment to reduce “churn.” Disruptions in health plan enrollment—usually due to changes in a person’s insurance coverage, employment status, or family structure—makes care coordination difficult and increases administrative expenses. Each change can mean new eligibility determinations and re-enrolling beneficiaries in new plans. The Affordable Care Act includes specific provisions to streamline enrollment processes. To further minimize the costs of churning, the Department of Health and Human Services and state governments should coordinate coverage policies and administrative systems across Medicaid, the new state health insurance exchanges, and the private market, and should promote continuous-enrollment policies. Leadership: Policymakers should exert leadership on administrative simplification reforms to ensure timely and innovative results. Create a new federal office within the Department of Health and Human Services to simplify health care administrative processes. Currently, jurisdiction for administrative reform is spread across different agencies. There is little coordination between these offices, and different offices may have competing priorities. To ensure the success of administrative simplification reforms, there needs to be a centralized office with the authority to oversee and coordinate changes across the public and private sectors. The sole mission of the new office should be to address administrative complexity. Elizabeth Wikler is a candidate in the Harvard doctoral program in health policy. Peter Basch is a practicing physician and the medical director for Electronic Health Records and Health IT Policy at MedStar Health. David Cutler is the Otto Eckstein professor of applied economics at Harvard University and a Senior Fellow at the Center for American Progress. This work was made possible by a grant from the Peter G. Peterson Foundation. The statements made and views expressed are solely those of the authors.